Crescent Industries is a family owned business dedicated to preserving the pride and craftsmanship that went into the building of products that formed American culture. The two products we are associated with, though unrelated are; vintage Vornado Air Circulators and musical instruments called concertinas. Vornados and concertinas were products built with pride by skilled craftsman, a trait that seems to be slowly disappearing with the advent of computerized technology. We at Crescent are craftsman and take pride whether it be the restoration of your vintage Vornado or the building of your new Eagle Concertina. We are up to the challenge of providing you with the very best in materials and workmanship. We do things the old fashion way, patience, skill, passion, and a lot of hard work! We are dedicated to preserving a piece of Americana for another generation. Thanks for visiting! 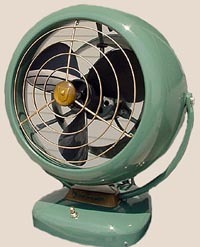 Check Out the Vintage Vornado page and the Eagle Concertina page for fans and concertina sale listings. New listings as of 01/30/13! and the All Star Honky Band! Keepers of Honky - Click here to get your copy today!